The Breeders’ Cup Juvenile Turf is a recent addition to the Breeders’ Cup series. It features young two-year old grass horse runners, and is highly anticipated by both North American and European breeders and bettors. The race covers one mile and the winning breeder gets to take home a $1 million purse. It’s an exciting end-of-year feature which earned its grade one event status in 2011. Read on for more on the Juvenile Turf race, racebooks, top entries and picks, and the race’s notable winnings. With the growing online racebooks market, placing bets on your favorite events and horses has become more convenient. However, with so many options to choose from out there, we always recommend that bettors use reliable sites that cater to American bettors. Our betting sites have been tested by our team of experts, and they come with great bonuses and loyalty programs. Much like other events in the Breeders’ Cup series, the Juvenile Turf race has the same international appeal. Entries into the cup race are two-year old horses, and the American breeds are more precocious than their European counterparts. Also, the breeds from Europe are much better on grass than their American rivals. Since the Breeders’ Cup Juvenile Turf race began in 2007, the Europeans have dominated the competition, taking the cup home seven times. This cup draws in a huge amount of interest and bettors get lucrative cash prices. When it comes to picking the right horse or horses for your ticket, we highly recommend getting to know the European horses. Usually, they make up the bulk of the competition in the Breeders’ Cup Juvenile Turf. Horse racing bettors paying attention to the trends in Europe have noticed that it’s usually the second or third choice among the European breeds that are the horse to beat. Additionally, something to keep in mind when picking a horse is how the race is shaped. 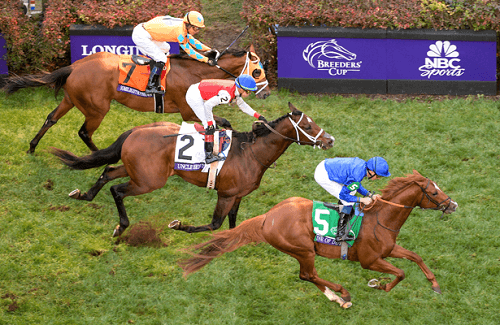 The Breeders’ Cup Juvenile Turf usually has a swift early pace due to the racers having a good gate speed. As mentioned earlier, the juvenile race has been dominated by the Europeans. Trainers Aidan O’Brien and John Gosden have racked up some major wins. O’Brien has won three times while Gosden two times. It seems like European jockeys also know how to manage the young ones: Frankie Dettori, who’s a common fixture, has won three different times with Irish jockey Ryan Moore managing the same feat. While, in terms of the horses, Oscar Performance has three straight victories to his name in the Breeders’ Cup Juvenile Turf. In 2016, the American won 7/2 odds and nearly beat the record set by Outstrip in 2013 with a time of 1:33.28 – Outstrip’s time was 1:33.20.